Handy men and handy women out there know the importance of carrying a tool box with you everywhere you go. Traditional tool boxes are often too heavy to lug around, but portable tool boxes are the perfect size to tote around anywhere tools are needed. We did the research and found the best portable tool boxes on the market to bring to you! There’s no reason to keep toolin’ around! Let’s take a look! Portable tool boxes need to be both sturdy and discreet. We found a handful of features during our research that will make finding a portable tool box easy. Here are 6 features you should keep an eye out for before getting your hands on a tool box of your own. Material: Durable tool boxes will last you a lifetime. Materials like plastic and metal are the most common for tool boxes, so look for one that will hold up to the test of time. Consider what its surroundings will be, too, before choosing the perfect box for you! Size: Depending on what tools you need to carry around the size of your tool box does matter. Make a list of tools you want to add to your portable fixer upper to determine what size tool box you’ll need. Extendable Handle: Carrying your tool box from one job site to the next will be difficult without a handle. If you are going to move your tool box often you’ll want to grab it by a handle and not the horns! Wheels: Another way to move your tool box to and from is with wheels! Sometimes your portable tool box will weigh too much to carry so wheels are a great option if you need to scoot it over in a hurry. Locking: Keeping your tools safe is a priority. Whether you’re leaving your tool box at a job site or putting it in the bed of your truck, you’ll want a locking mechanism to keep your expensive tools secure. Warranty: Any good tool box comes with a warranty. Sometimes a lock may break or the box won’t close all the way, but with a warranty any defect will be covered and replaced with ease. Check for a warranty before your purchase! Now that you know how to choose the best portable tool box, we can show you our top 10 choices. Our top pick and budget pick are our top two choices, but we have a handful of other tool boxes we loved to that are added to this list, too. Grab your hammer and let’s get swinging! For a durable steel tool box, you’ll want to look to the Homak Industrial Steel Toolbox. Inside the tool box you’ll find 4 separate shelves to stow away your tools. The bottom storage area is great for bigger, heavier tools, while the shelves are great for your more frequently used tools. There are 3 locking mechanisms to keep your tools safe while moving from one job site to the other. If you want to add a padlock to the front, feel free to do so as the locks are big enough to handle a full sized lock. If you come up missing part or find that your tool box is damaged, this tool box is covered by a one year limited warranty. 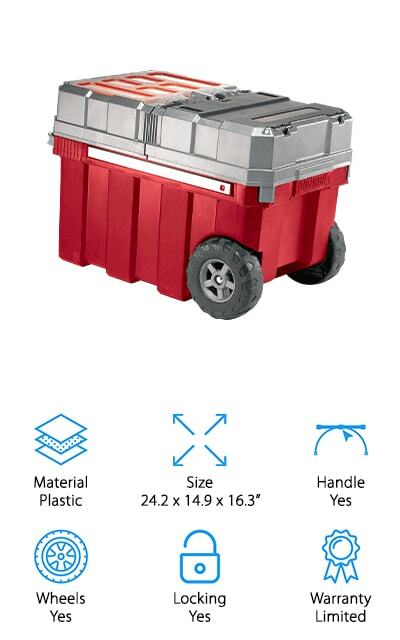 The Homak Industrial Steel Toolbox is a professional portable tool box for the handymen and women who need security and storage in a durable metal box. Grab your tools and fill it up! The Homak is meant for you. Our budget pick comes to you in the form of the Stanley 028001L Foam Tool Box. This tool box is made out of structural foam to give your tools enough room and support inside your portable tool box. With two locking buckles, you can be sure that your tools will stay secure even if it’s knocked off or turned upside down. The handle gives you the perfect grip on your tool box when moving it from place to place. There’s a v-groove on the front of the tool box to assist you with cutting and measuring your projects. Inside is a half tray where you can store some of your smaller tools and accessories, but the main compartment is the perfect place to put your heavy duty tools. If you’re looking for a large portable tool box on a budget, Stanley’s 028001L Foam Tool Box gives you plenty of space and security for your most essential tools! The DeWalt Mobile Work Center is quite the mobile tool box. 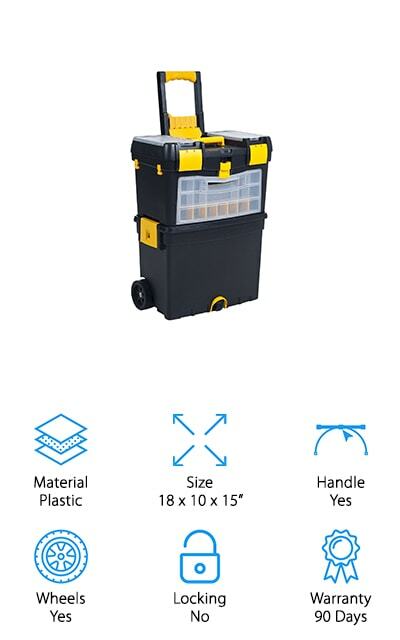 This 28 inch tool box pulls out into 3 separate compartments. With one quick movement, the 3 compartments will pull apart giving you access to everything you need. 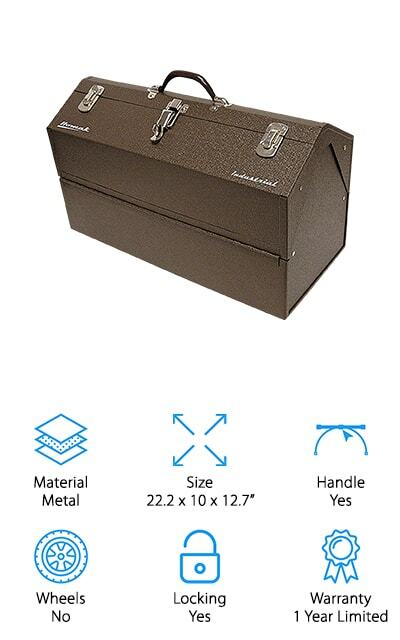 The bottom portion of this tool box is made for your bigger, heavier tools. The other two drawers will fit your most frequently used tools. The middle drawer has organization storage and dividers to keep everything in its place. Many buy this tool box to keep all of their tools in one place instead of all over their garage. 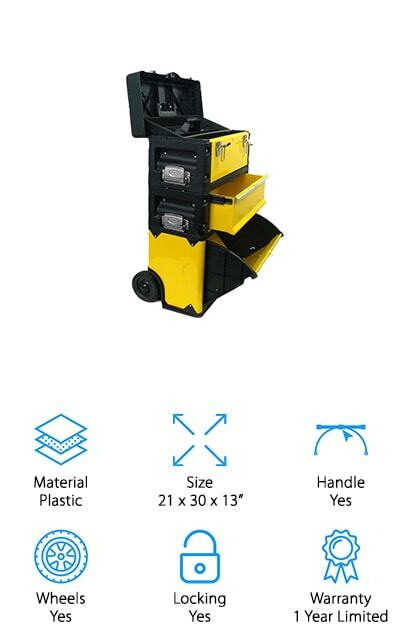 You’ll be able to pull this tool box just about anywhere with an extending handle and wheels that make steering it around the job site easy. This tool box was designed for rough job site environments of plumbers, engineers, and contractors alike. If the DeWalt Mobile Work Center works for professionals, it will surely work for you! The Trademark Tools Portable Tool Chest is 3 tool boxes in one. With 3 separate boxes for you to organize your tools into, you will have plenty of storage for all of your tools. Inside the top tool box you’ll find a shelf to place your smaller tools. The middle tool box is standard size, while the bottom tool box is a larger area for you to put your heavy duty tools. There are two locking mechanisms on the front to keep your valuables secure. The wheels on the bottom are made to glide easily on any surface. Whether you’re in the garage or at the job site, you’ll be able to pull in the big guns when you need them. The bottom line is this vertical tool box as all the storage you need to keep all your tools in one place. You’ll find that the Trademark Tools Portable Tool Chest will come in handy no matter where you are or what you need! If you’ve had a hard time finding a pink portable tool box, look no further! The Pink Power Portable Tool Box is perfect for the handywoman in your life. Made from aluminum, you’ll find this tool box surprisingly lightweight and easy to handle. The box itself weighs just under 5 pounds and the comfort grip on the handle takes the pressure off your hands. Once open, you’ll find two small compartments in the lid to store your smaller tools and fasteners. There’s also a removable tray in the middle to place your bigger hand tools. The very bottom of the box is used to store larger, heavier tools that aren’t used as often. You’ll see there are two fasteners to keep the box together and closed. There’s also a padlock hole built in for extra security for when you’re away from your box on a job site. 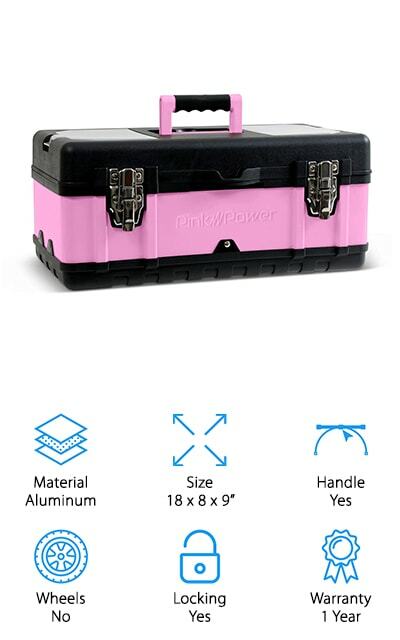 The Pink Power Portable Tool Box is perfect for any lady who is looking for a small portable tool box with personality. This Craftsman portable tool box has plenty of storage. The top section opens up and gives you room for your bigger tools while the drawers in the front make room for any smaller hand tools. Made from durable steel, you’ll be hard pressed to find something that can damage this tool box. The handle at the top makes it easy to carry to and from job sites or out to your carport to work on your car. The two latches on the outside keep your top storage area closed to keep your tools from falling out while you carry it to and from place to place. When the lid is closed and latched, you won’t have to worry about the drawers falling out either as they lock up and are unable to open until you unfasten the latches. 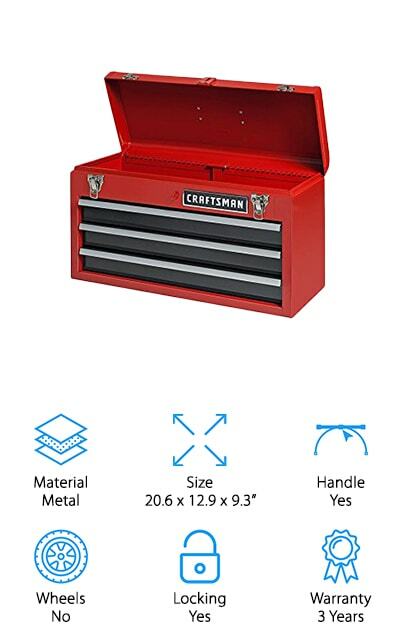 The Craftsman name has been trusted for years and this tool box is no different! Pick up a Craftsman Portable Tool Chest and you won’t be sorry. 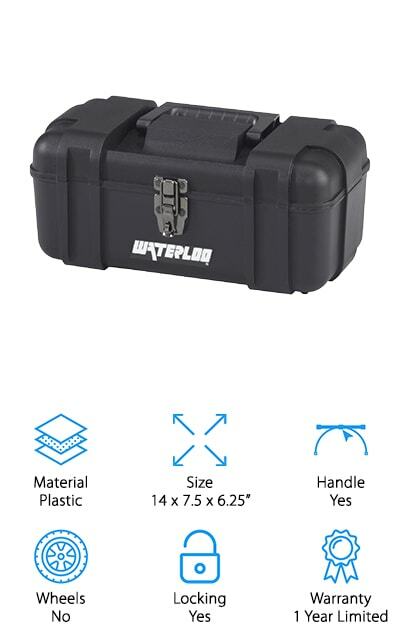 The Waterloo Portable Tool Box is a heavy duty, plastic made tool box with all the essentials. Made in the United States, Waterloo didn’t skimp on quality or durability. Inside you’ll find a plastic, removable tray where you can store your smaller handheld tools and parts. In the bottom, you have room to place your bigger tools to keep them out of the way unless you need them. The comfort grip handle is perfect for carrying this tool box wherever you go and the latch on the front keeps your tools inside no matter what’s going on around it. This tool box will last as long as a steel tool box, but without all the weight you’ll be able to carry more tools without breaking your back. Because it’s plastic, you’ll also never experience any dents or rust either. The Waterloo Portable Tool Box is a great tool box for those who want a lightweight tool box without losing durability. The XtremepowerUS Tool Bag is more of a tool bag than a tool box, but it has all the same features of a tool box and then some. This bag is made of water resistant polyester and has tons of pockets. You’ll find 9 pockets on the outside and 10 pockets on the inside, so you won’t have any complaints about storage. The handle can extend pretty high as this bag does have wheels. 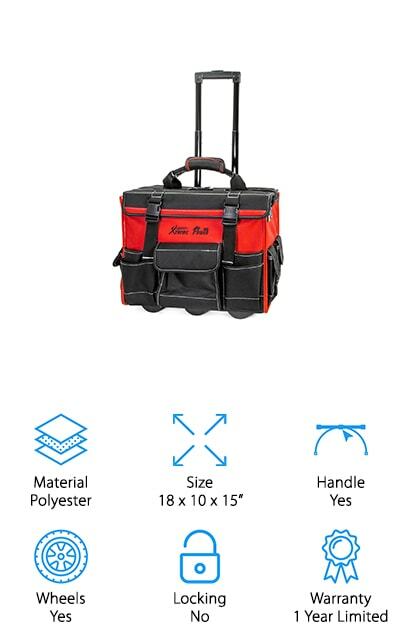 You can push this bag all over without having to worry about losing your tools on the way. Just strap it down and you’ll be good to go. There is an additional backpack you can buy separately that will fit on top of this suitcase style tool box if you need more space, too. Just slip it on over the handle and you’ve got a 2-in-1 tool bag. If you’re looking for an untraditional tool box that can resist weather and carry all of your tools, the XtremepowerUS Tool Bag is your best bet. The Stalwart Mobile Toolbox is another great tool station that will make life on the job much easier. With two separate tool box compartments, you can decide what to take with you or leave at home. Inside each of the boxes, you’ll find a removable tray to help organize the smaller tools that could get lost among the heavier ones. If you have extension cords, around the top of the first tool box has cable hooks to keep them organized and untangled. Each tool box has two compartments for big tools and a tray, but the top box has 24 smaller storage compartments that are made for small parts and pieces. 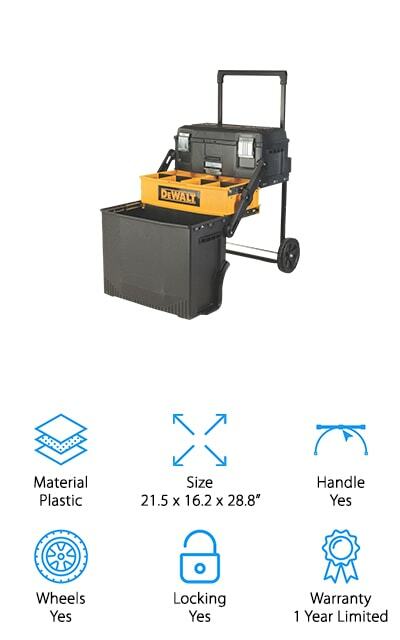 You can take the first tool box out and run with it if you only need the essentials, but the best part about this mobile station is that it allows you to roll both tool boxes together if you’re working on a big project. The Stalwart Mobile Toolbox is a great purchase for anyone with tons of tools and even bigger projects! 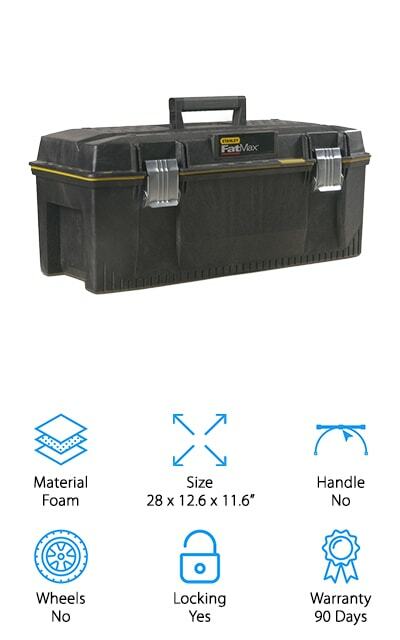 The Keter Masterloader Tool Box is made from durable, strong plastic you’ll find an array of compartments inside to store your biggest and toughest tools. If you like to keep your tools organized, you’ll be happy to find an integrated tool organizer and divider to keep everything in its place. Put your most frequently used tools in the top and heavy tools in the bottom to make work easier and more convenient. With wheels and a handle, you’ll be able to drag, scoot, and carry this tool box wherever you need it. No longer worry about security, this tool box has a central locking system to keep the greedy hands out. The central locking system also acts as a barrier to keep your tools safe and sound when traveling from place to place. The Keter Masterloader Tool Box is a top of the line heavy duty portable tool box.